스페인아이벡스(Capra pyrenaica)는 소과 염소속에 속하는 야생 동물의 일종이다. 4종의 아종 중 2종은 현재 이베리아 반도에서 발견되지만 2종은 멸종된 상태이다. 아종 포르투갈아이벡스(Capra pyrenaica lusitanica)는 1892년에 멸종했으며 피레네아이벡스(Capra pyrenaica pyrenaica)는 2000년에 멸종했다. ↑ Herrero, J.; Pérez, J.M. (2008). 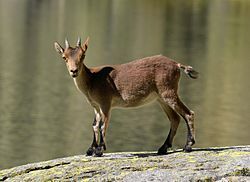 “Capra pyrenaica”. 《IUCN Red List of Threatened Species》 (IUCN) 2008: e.T3798A10085397. doi:10.2305/IUCN.UK.2008.RLTS.T3798A10085397.en. 2015년 10월 27일에 확인함. ↑ 가 나 다 라 마 Perez, Jesus M.; Granados, Jose E.; Soriguer, Ramon C.; Fandos, Paulino; Marquez, Francisco J.; Crampe, Jean P. (2002). “Distribution, status and conservation problems of the Spanish Ibex, Capra pyrenaica (Mammalia: Artiodactyla)”. 《Mammal Review》 32 (1): 26–39. doi:10.1046/j.1365-2907.2002.00097.x. ↑ Sarasa, Mathieu; Alasaad, Samer; Pérez, Jesús M. (2012). “Common names of species, the curious case of Capra pyrenaica and the concomitant steps towards the 'wild-to-domestic' transformation of a flagship species and its vernacular names”. 《Biodiversity and Conservation》 21 (1): 1–12. doi:10.1007/s10531-011-0172-3.